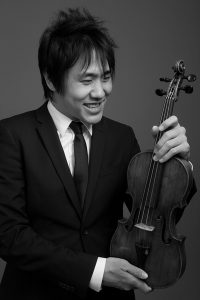 A native of Saint Louis, violinist Henry William Wang has won several engagements as soloist with orchestras including the University of Chicago Chamber Orchestra, the Alton Symphony Orchestra, the University City Symphony, the Belleville Philarmonic, and the Saint Louis Symphony Youth Orchestra. He is also the winner of the Artist Presentation Society Auditions, the Missouri Federation of Music, a prize winner at the Chautauqua Music Festival Aria and Concerto Competition, Northwestern Thaivu Competition as well as the Norshore Scholarship Competition. Venues of solo performances have included The John F. Kennedy Center for the Performing Arts and Powell Symphony Hall. As an orchestral musician, Henry has served as concertmaster for the Northwestern University Baccalaureate Orchestra, Saint Louis Symphony Youth Orchestra, the Missouri All-State Orchestra, the Chautauqua Music Festival Orchestra, the Northwestern University Chamber Orchestra, guest concertmaster of the Amarillo Symphony Orchestra and was a member of the Verbier Festival Orchestra. Currently residing in New York, Henry performs with the Trinity Wall Street NOVUS ensemble, the New York Classical Players and is a substitute member of the New York Philharmonic. Henry is a graduate of the Juilliard School where he studied under Glenn Dicterow as a C.V. Starr and Juilliard Alumni Scholarship, receiving a Master’s degree in Violin Performance. He also received his Professional Studies and Master of Music in Orchestral Performance under the tutelage of Mr. Dicterow and Lisa Kim at the Manhattan School of Music. Previously, he attained his Bachelor of music as a student of Almita and Roland Vamos at Northwestern University under the Catherine E. Sutherland scholarship. Henry is also active in the crossover classical music scene, having appeared with his group, The Gentlemen of NUCO, on the show America’s Got Talent.